Some days, I wish I could go back in time to my fifteen year old self and shake myself silly. The fifteen year old self who thought her chest was too small and her hips too wide for her too thin waist and flat as a washboard stomach. Oh you silly, silly girl. Why in the world are teenage girls programmed to despise themselves so?? What I would give to go back in time to appreciate the beautiful body I never knew I had. And now I sit here, in my mid-thirties, after having had three kids over the course of four years, wishing my hips were only as wide as they were twenty years ago or that my chest were nearly as small or my stomach as flat. Oh, the lessons we learn too late. And while I may never be as small as I was then, I am confident that I will regain a healthy and strong figure; a body I am proud of as much for the way it looks and feels as I am for how it has grown, birthed, and nourished my three beautiful babies. It’ll just take a little effort to get there. I’m 17 days into my New Year’s diet; a diet which I intend to stick with, long past the one month expiration date which many people’s New Year’s resolutions seem to have. Because it’s more than a diet. It’s a shift to healthier living and a healthier, more confident me. I’m feeling motivated and optimistic. Over the past few weeks, we’ve eaten so many delicious meals; cut out the junk we shouldn’t be eating anyway and replaced it with tons of fresh veggies, lean proteins, and healthy fats. We’re eating like kings around here and our extra pounds are falling off. 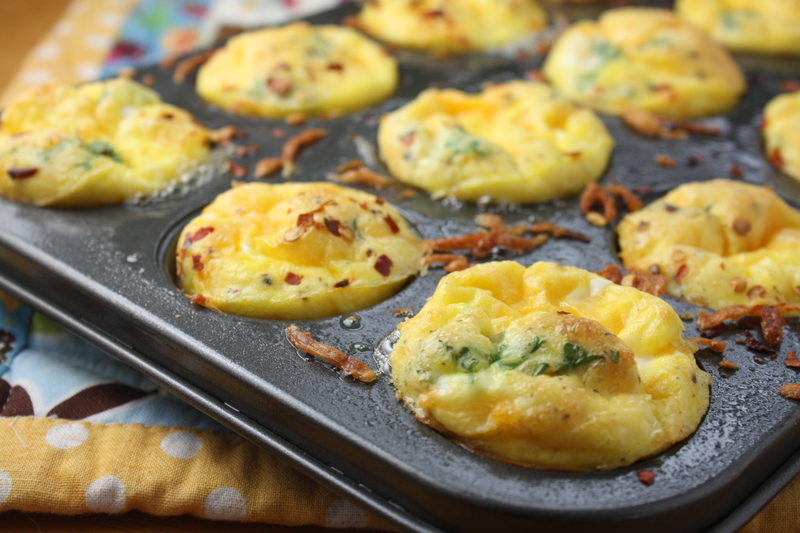 I’ve got a growing list of new healthy recipes to share with you, but for now, here’s a quick recipe for a delicious, protein-rich, low-carb breakfast or snack. These mini quiches hold well for a few days in the fridge and take only a few seconds in the microwave to reheat. You can even freeze half the batch for later use! I added swiss cheese, tender, sweet onions, and crumbled bacon for a tasty play on quiche Lorraine, but the options are endless. 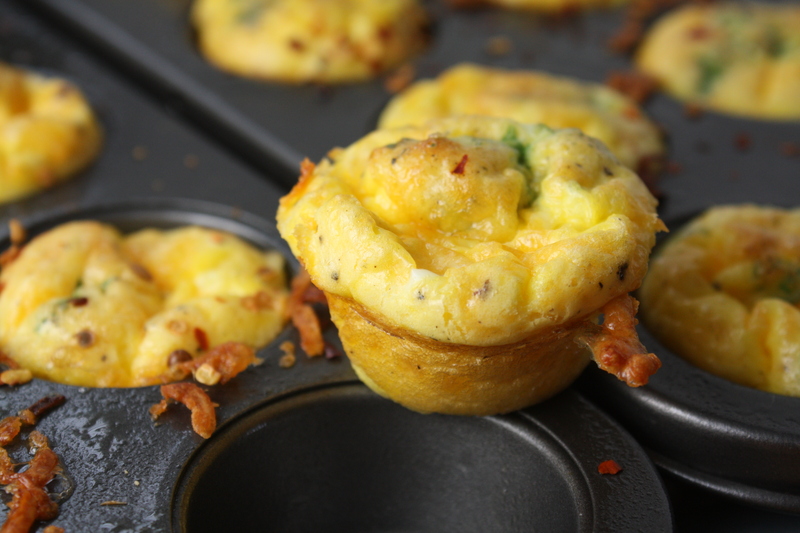 Try different combinations of cheese, veggies, and meats to create your personal favorite mini quiches! Preheat oven to 375 degrees. Spray two mini muffin tins with non-stick cooking spray. In a small pan, heat the butter over medium heat. Add the chopped onion and cook for 7-10 minutes, until tender and golden. 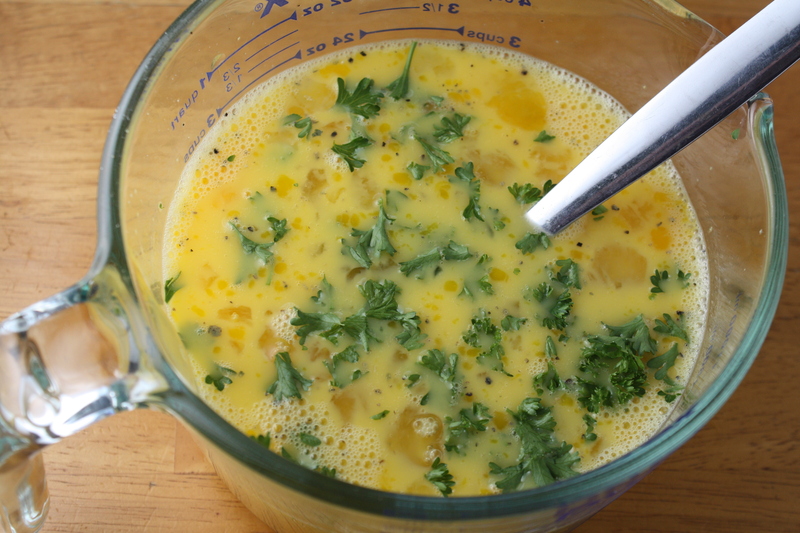 In a large measuring cup or bowl, whisk together the eggs, milk, salt, pepper, and parsley. Set aside. 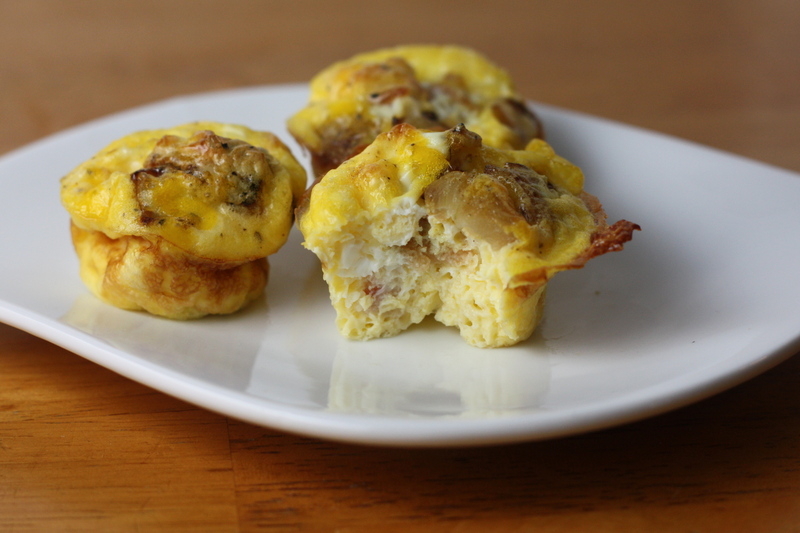 Place a pinch of the cheese, onions, and bacon in the bottom of each muffin tin. Then, carefully pour the egg mixture into each tin, just to the top. Place the trays on the middle oven rack and bake for about 15 minutes. They will look puffed and golden when done. *Quiches can be served immediately or refrigerated or frozen for later use. A few seconds in the microwave will do the trick for reheating. Diet Day: 17 Weight Loss: 11 Motivation: Let’s do this! Posted in Breakfast, Cheese, Eggs, Food, Main Course, Recipes and tagged bacon, breakfast, cheese, Cooking, diet, Eating, eggs, Food, healthy eating, kids, life, pregnancy, Recipes, south beach diet, vegetables, weight loss. Bookmark the permalink. Oh if only I knew then what I know now! Love this recipe- I’ve made variations of these and they are so good! Your motivation is contagious. Thank you! Love these! I make the bigger version for my clients but these would be awesome as a quick breakfast for kids. Great idea! I make something similar to these and call them breakfast cups! I love how versatile and satisfying they are, while still being healthy! These look fantastic! Thanks for the idea; I need to start cooking some healthier options! These look great — and so easy! I love mini quiche!! These look very delicious 🙂 and crust-less is the way to go if weight loss is your goal!! Keep up the great/challenging work. Thx for wonderful tips on how to make smaller yet fantastic foods for our kids. I’m going to make this with my 7 year old who doesn’t need the crust! Yessss, I love quiches and I love mini food, this is a great post! I made quiche for dinner tonight, but a large one. My kids each like different things with their eggs, so I’m going to make these like I do with my weekly pizza-personal quiches! The kids can pick what they want in their quiche (bacon vs ham, spinach vs peppers, etc). Thanks for the inspiration!! Loved it! These are so simple and the ingredient list is so easy. I hate recipes with over 50 different ingredients that you have to make a special trip to the store for. I substituted Swiss for cheddar and bacon slices for real bacon pieces that you’d use for salads because that’s what I had in the house. I actually had the fresh parsley from the chicken soup I made recently. I used a regular muffin tin since I don’t have mini muffin tins. I’ve made these twice. They reheat so well. Breakfast is so hard when you’re dieting and getting a nice hot breakfast with plenty of protein is even harder especially when you don’t have an hour in the morning to cook it. Just pop these little guys in the microwave for 30 seconds and they’re hot and just as good as they were right out of the oven. Thanks for the great recipe! Great! They turned out all lovely and puffy. I changed it a bit by using butterball turkey bacon and 4 eggs & 1 c egg beaters also gruyere cheese on the bottom & a little sharp cheddar on the top. Delicious! Thanks so much! Its a keeper! wow these look yummy and im going to try them this week, just wondering if anyone who has made them knows how many calories are in 1? Nope! Sounds just about right. The heat puffs them up and then they deflate a bit as they cool and release some of the hot air. Those were AWESOME! Thank you so much for a delightful recipe. I did add a little more (maybe another 1/2 cup) along with a heaping tsp of Dijon mustard. I also used medium sized muffin tins and I just ate 2 for dinner. Yaaay – I now have 10 more servings going into the freezer. Good food – loved it. Sorry – I meant to say another half cup of Swiss cheese. Thanks for a great idea. I did tweek the recipe to suit my eating plan but basically it was your recipe. My husband loved them and we wolfed down three for lunch.